How to Make Candles Video Ready! After a 16 month hiatus we are back to filming "How to Video's" and the most popular of all requests, "How to Make Candles" has been filmed and is ready to go. 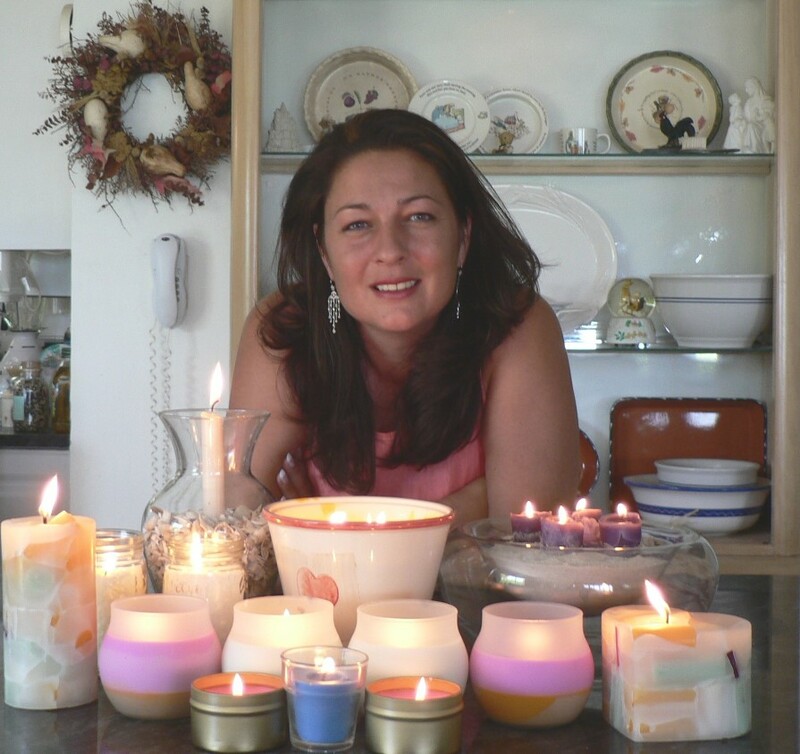 This instructional 1 hour DVD Video is fantastic and covers every area of candle making. The techniques are easy. The video shows you all you need to know about making Soy Container Candles as well as Pillar, Sand, Large Soy Outdoor as well as other popular types of candles such as Pillar Chunks with Paraffin. Using molds, when necessary, is also discussed in-depth. The video also shows you how to make the easiest "no melt" candles there is to make. Instructed by Deborah R. Dolen, author of 22 craft books, and several video productions, this video is wonderful for children also. About the only candles we do not discuss is gel, because we personally feel gel is too volatile. In addition, you will learn the best types of wax as well as wicks, colors and fragrance. This is to ensure your candle will not only look beautiful but will have a great even burn as a candle should. 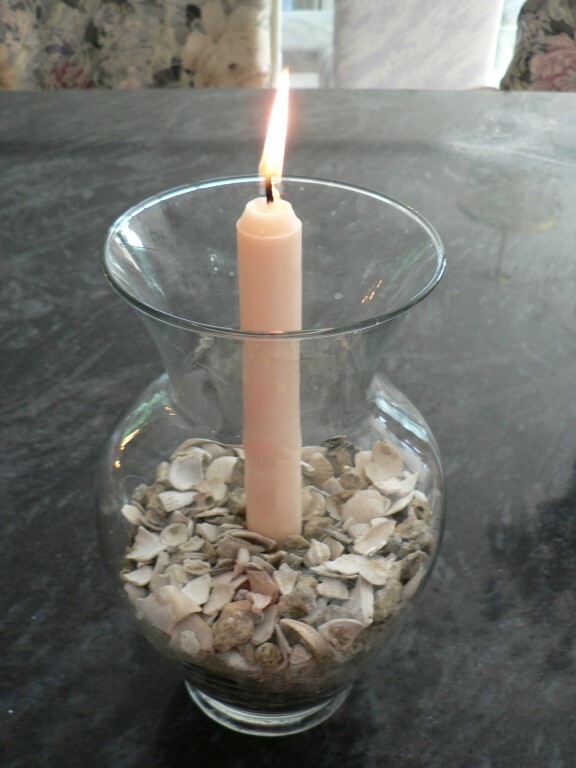 Common candle mistakes are discussed as well as new solutions to old issues known to advanced candle makers. This video teaches beginners as well as enhances the knowledge of anyone that is already well into making many types of candles. Click thumbnail for a better view of the candles made in the video. Click here to see short segments of the video and to order. For years we had not addressed which oil based color was good for candle making, because we could find no consistency in that market or anything unusual. Even the best of oil based colors could not make soy, for example, anything better than a pastel. Over the last year we have been testing our own dyes with major manufactures and coming up with bright and magnificent colors that can make soy wax scream with color, as well as other products. The liquid dyes are non-toxic and virtually eliminate particles in candles and sediment in equipment. 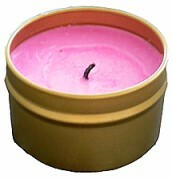 The photo below is soy wax poured into a gold travel tin with just a few drops of our magenta oil based color. It could have been brighter if we added a touch more color. Because you can mix the primary colors to make great shades and hues we are making sure to offer the basic red, blue and yellow, as well as some already mixed glorious shades such as magenta and rose. For example, just one drop of blue will make an outstanding turquoise. If you really aim for a true blue--just a few more drops. Another attribute of our new oil based color line is that you can layer soy, such as we did below, and achieve beautiful color combinations. This candle shown here is orange layered with hot pink. We did not even use that much color to achieve this vibrancy. So our new oil based dye offers colors formerly not achieved when making soy candles. The colors are so vibrant, one ounce should last you a very long time and can be used for other projects, such as making toiletries. The color is so dense, always make sure to wear gloves when even breaking the safety lid, as it is almost impossible to get off of your clothing. This is some of the best progress we have made in years and hope you enjoy them! Click here to purchase oil based color. "If you don't know where your going, it does not matter which way you go." Don't throw those old vases out! They are now "in." Even if they are straight up and have no curve, they are perfect for this project! Also scrounge around and find your old tapers and votives, that were once considered too messy to burn. No longer will you have to buy candle apparatus, that has to be cleaned anyway. No one wants to clean up the mess, me included. This new method also fits in perfectly with the new "Shabby Chic" and relaxed home designs. I have always liked the container soy candles in galvanized tin, frosted or ginger jar type glass because there are no real clean up issues. They will always be my favorite, but for serious entertaining, I just could not help resist this new way to get rid of old floral vases, as well as those little votive candles, taper and pillars I consider to be beautiful--yet messy. If you do not have any glass, they are only about $2 at your local craft store. That goes for votive and taper candles also. You can always find them on sale. To Make: Enter crushed shell, sand, or just small white river rock. I can go in my back yard and get these items, but if you cannot, Home Depot does sell such by the 5 or 10 pound bag and are well worth having around. Most people already have vases from getting flowers, and candles they just will not use hanging around the home. You can even paint the outside of the glass if you want a special color throw. The one photo I could not shoot was a large galvanized bucket (cheaper from a horse and feed store) that is usually filled with ice and drinks at parties. You can fill them with sand and toss several lit tapers in them. That has a profound effect, and definitely will make for a conversation piece. You can put flower petals around them also. The photos I did shoot are more romantic and can be used as a dinner centerpiece, indoors or outdoors. When potpourris and floating candles were really hot, I got stuck with the glass bowl photographed here--I was never sure what I was going to do with it. 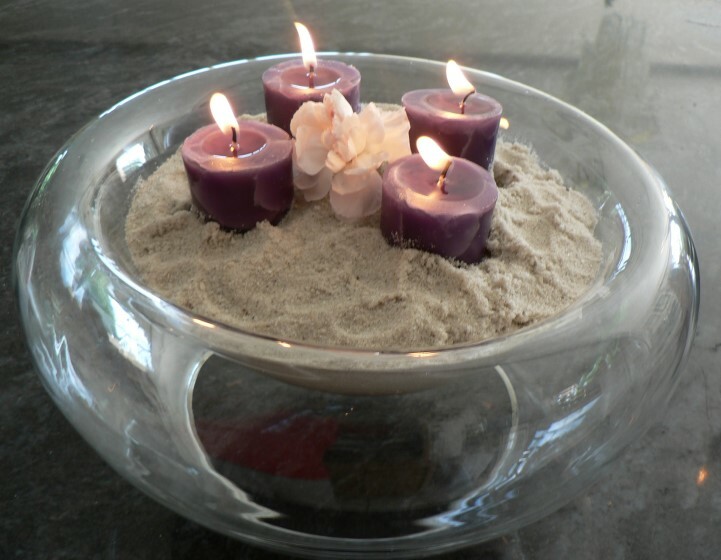 Well, it worked out great for this project with some sand and simple votives arranged in it. The other shot is of a vase I grabbed and set in crushed sea shells. The only thing challenging about the vase creation was to make sure I used a mason funnel to keep the taper straight as I poured the shell around it. I do admit I had to break the taper in half to make it fit for the photo. But when these candles are done burning you can simply discard the contents and save the glass. 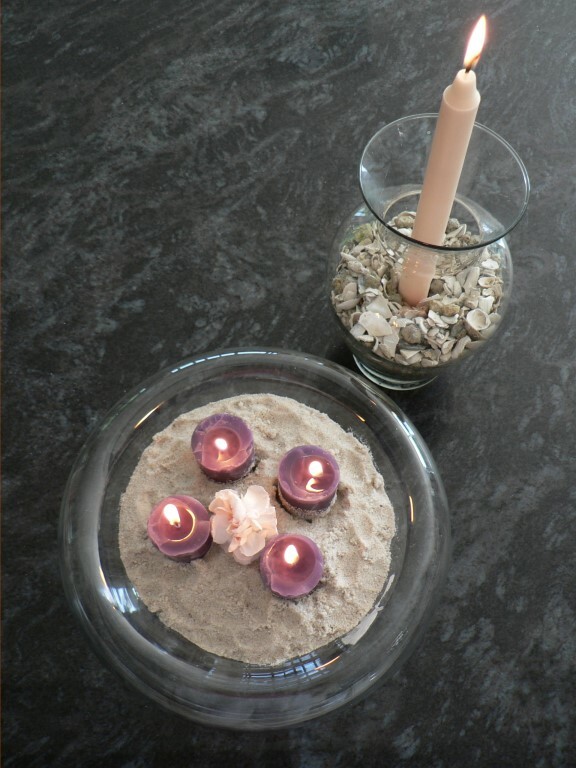 The next time you want to entertain, you can start all over again with more sand, or crushed shell and new candles. This new method just made candle issues as easy as setting flowers for entertaining. One important note, use a long fire starter such as you would with a fire place or gas grill. It is hard to light them up close with other candles already lit. For sand or crushed shell click here. "Progress is a tide. If we stand still, we will surely drown. To stay on the crest, we have to keep moving." In the last newsletter (Click here) I addressed using Vitex tincture and a special Essential Oil blend to help with the effects of Peri-menopause and Menopause. I was stumped because I didn't receive any email requests for more information, and I honestly expected to be inundated! What I didn't know was that the link to my email address was broken, and Deborah was getting the questions instead of me! (Deb's recommendation was to go for a Hysterectomy! She had a partial 15 years ago and thinks it was one of the best things in the world, although she admits she was very scared at first.) Granted, a Hysterectomy is sometimes medically warranted, and most of the people writing her were facing surgery, but having this major surgery just to avoid menopausal symptoms is a drastic first choice, especially when there are natural helpers to aid us with Mother Nature. I do recommend that you make your own tincture rather than buying it. (Directions) I have sampled a few of the commercial brands and found that I prefer to have the control over what goes in it (and what doesn't!). I also like the strength of my tincture better. If you don't want to make your tincture using alcohol, just follow the original instructions, but substitute a carrier oil for the alcohol. You'll need to increase the steeping time to at least 3 weeks, a month is better. A quick tip to cool hot flashes: To make a portable cooling mist, add 1 3/4 ounces of distilled water to a sterilized 2 ounce spray bottle. To this, add 3 drops of Peppermint and 3 drops of Bulgarian Lavender Essential Oils. Shake well and spray. Carry the bottle in your purse so it's there when you need it. What is "in" is fueled by a younger demographic, urban style, popular culture, world events, media trends, club culture, generational shifts, fashion, influencing art & craft design. A more sophisticated look is emerging the style is urban, artsy, shabby chic, unique to the creator. And the new direction doesn't follow a pattern which allows for a lot of creativity. Even paper crafts are going more simple, elegant and modern. 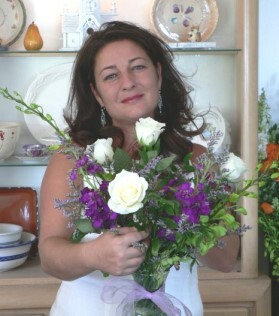 Couples are opting for making wedding stationery, invitations, thanks you and place cards for their own personal touch. So, what is hot? Needlecrafts, knitting and crocheting are growing thanks to the new elegant yarns and fibers available now. Knitting is not just a fashion statement or embellishment, it is also making inroads into the home d�cor arena and an activity that promotes "centering." Paper Arts and Scrap Booking are hot and getting more creative thanks to the advancement of many new products. Handmade greeting cards are elegant, upscale with attention to detail. The personal computer has really have allowed this area to boom and open the doors to endless creativity. Painting wooden furniture no matter how you get it, can be painted and perhaps stenciled to capture the "shabby chic" spirit. Even the classic white wicker is being daringly spray painted white bright orange, pinks and purples with great success. Pottery and Ceramics thanks to more easy and non-kiln methods of application. Candle Making as it allows the designer to "pull rooms together" and achieve results that just cannot be found in stores. Because of the Shabby Chic passion, Soy and Sand candles are really hot. Kevin Trudeau's Natural Cures "They" Don't Want You To Know About is now in bookstores. If you bought it, take it back! If you didn't buy it, don't! If you bought it from one of his infomercials, I'm so sorry. By now, most of you know that I prefer nature's gifts over the synthetic, man-made junk. You also probably know that I have a healthy distrust for some of the Government regulating agencies, and that I also have a tendency to expose false products and give you honest, forthright product information and opinions, based on my own experiences and on research. Trudeau's checkered past includes serving time in prison for various types of fraud, (do you smell something here, or is it just me?) and numerous, on-going battles with the FTC and other regulatory agencies. 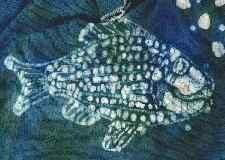 You may have seen him in some infomercials, most notably the ones touting Coral Calcium. (He's now banned by the FTC from doing infomercials.) He sets himself up as a consumer advocate, natural health "expert" and innocent victim of the FDA, FTC, Corporate America, USDA and just about every other organization you can think of. Fine. There are believable horror stories of governmental and regulatory agency abuses against small businesses whose only "crime" is to offer natural products for sale. (I often take issue with the FDA, Big Drug Companies and other associations when they try to stomp on the little guys. I write my Congressman a lot!) I don't believe that Trudeau's is one of these cases, however. Statements made as fact with absolutely nothing to back them up. No references cited, nothing. His Alliance Publishing Group goes so far as to solicit authors who can't get their books published anywhere else because they're too controversial. (Oh, Geez! The publishing world isn't known for steering clear of hullabaloo...Controversy sells books!) Send him manuscripts at your own peril! Life is short and money is tight. There are too many well-written, content-rich books out there to waste $29.95 on this one. Good readers deserve good authors. Hucksters, charlatans and money-grubbing con-artists who prey upon those who are sick and desperately looking for help deserve to roast in Hell, and their books deserve to line the bottoms of bird cages. Lucky for me, I kept my receipt! *Comment from Editor: We try to stay out of politics, but Leane is right. I almost bought the book because the guy seemed so believable. Yeah, those 4 AM infomercials when you just cannot sleep. Not only is it cheap air time, sick people are up at that time. Great air time for an insomniac remedy if there was one. So, his book, if based on fact--had perfect marketing. That is all I have to say. I already knew the Coral Calcium was as good as licking cement (limestone) and not really harvested off some special shore in Japan. I knew someone with permanent back pain praying that would work. So I researched that. That is just too bad for those who want hope. It never hurts to keep looking for solutions but apparently what this guy is selling is not a viable one. I guess all he is selling is "HOPE." "You cannot teach a man anything; you can only help him to find it for himself." OK, they are now known as "glue dots." Once only available to major corporations to stick a free item on to a finished product--without harming either product--are now available to the little guys. When I first saw this type of sturdy, yet harmless pull off glue years ago, I could only think of one thing to call it. Snot. It had no name and when I called different vendors, they knew what I was talking about--but never had a name for it. Credit cards are often mailed with this "glue dot" to secure them. I could see doing endless things with this type of medium. Most importantly keeping our wicks anchored and straight in candle making. Now they are used for scrap booking, photo frame adornment, magnets, presentation boards, mockups and other office projects. I use one dot to go on top of a cr�me' jar and secure a tiny flower. Glitter can also be poured over them. Craft Glue Dots are a great, all-purpose adhesive for multiple uses around the house, too. I like them to hold candle wicks right in place without having to get out the glue gun. You can also use them to attach product information, recipes, or small love notes for gifts. Not all dots are as strong as others and we sell the stickiest, yet easy to pull off, snot there is. Click here for glue dots. A combination of watching HGTV and how they marbleize things, searching for a tile design for my new studio floor, and a few other factors led me to this. I also learned how to use sand in paint for texture. On HGTV I saw a quilt maker talking about how she uses photographs of flowers kind of arranged near each other for inspiration of her fine quilts. I then saw another designer using magazine cut outs for their inspiration of scrap booking. If nothing else, they comforted me that we all get our inspiration from somewhere, somehow. I am hardly alone. I have been waiting for years to find a medium of art to really run with. You know, art for the home we often cannot afford--or think we cannot. I snubbed sketches, oils and acrylic, in part because everyone was doing it. And we all can think of someone related to us who drags us to a painting they made, loving what they created--and we are thinking "Oh Boy, I hope I never do this to anyone." Pretending you love it also. What else can you do? Some are excellent. I admit that. With all of the new technology before us, even a beginners with a touch of vision can kick out some magnificent large art for under $20. OK, maybe $20 when your technique down pat. One thing I did learn at Ringling School of Art is that any art school usually has a store that will stretch your canvas and put it on wood for some $10--after you have completed most of your art. Where am I headed with this? 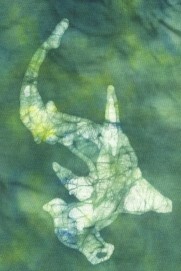 A combination of tie-dye, fabric design, working with raw canvas and batik. I like the work of Matisse, so I decided to call this mixed up but easy concept I created "Matik." In this process you can use soy wax instead of hard to wash out paraffin and beeswax for the Batik part, as well as our new bright dyes in the soy wax phase. Below are some very brief ideas of where I am headed with this, but the sky is the limit. First, the fabric is washed and dried at least twice to remove oils, sizing and other chemicals that hinder the absorption of dye. Next, it is soaked in a strong soda ash solution, wrung out, and dried completely without rinsing, so that deposits of dry soda ash are left behind in the fibers to activate the dye later on. This completes the pre-treating phase. This is how tie dying starts out. In this case I use raw canvas. When dry, you can sketch out ideas with a fabric marker. Outline the area's you want to stay white with melted P-1 Soy wax and cheap brushes. P-1 means pillar SoyWax blend. Container blend is OK also but P-1 is better. Draw area's you want saturated with true color--with color dyed C-1 or P-1 soy wax. The nice thing about soy wax is it will come out much easier than beeswax or paraffin. Apply any other fabric type dye to the area's that do not have wax on them. Crumple the fabric if you want a lot of veining, or use rubber band methods, putting even more dye onto areas after banded. Wash the excess dye out, after the full "batching" time of 2 to 24 hours has passed, using cold water only. Repeat if desired. For traditional, multiple-step batik, air-dry, and repeat the waxing and dyeing steps as desired, starting with the lightest colors and progressing toward the darker ones, first spending some time to plot the appropriate order for the colors and how each color will mix with the previous ones. 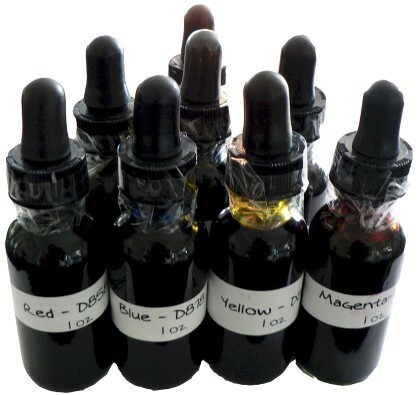 For modern "faux" batik, a single round, involving direct application of different fiber reactive dye colors where they are wanted, is sufficient. Getting the wax off: I can usually get soy wax off with a plastic spatula. If that does not work, try simmering in hot water, with soap. Add liquid soap, rather than detergent, to the water. I've had excellent results with Dr. Bronner's brand liquid castile soap, which is commonly available in whole foods stores. Using this soap, I did not have to get the water anywhere near a boil before all of the wax had floated to the top of the pot. The procedure is much more difficult without soap, though you can re-use the wax if you don't use soap or detergent to aid in its removal. Iron your final product to send off to the canvas stretcher and they can also guide you to a finishing spray to protect your work. After it is framed you may want to touch up with acrylics, and or textures such as sand in your paint. Although this site was only one inspiration towards the process, Paula Burch really has the neatest site and some of these examples are from her site. Paula does most of her work on her families T-Shirts but her talents should be on canvas. If you want to play it totally safe, wait until I am done with mine. I just ordered a ton of raw canvas and expect to have issues until I become Rembrandt in a few months. So, maybe wait a few months for my finished article or write me as to how yours is turning out. Good Luck! "When solving problems, dig at the roots, instead of just hacking at the leaves." Truly a moment we have all been waiting for. One mark of our Fifth Year Anniversary includes the opening of "The Mabel White House." The Mabel White House was designed as a peaceful retreat that readers could actively participate in. Many customers have followed us the whole five years and would love to meet us and get to know crafts more hands on. We welcome the opportunity to get to know them. 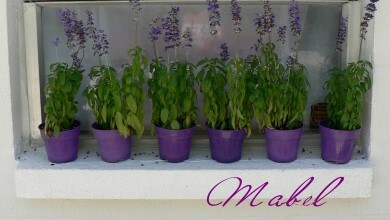 The Mabel White House is designed to conduct craft and spa type classes. The Mabel White House is more than just an experience. It is a lifestyle. Click here for more info on the Mabel White House. as well as his tactics is totally useless."